A pilot project aimed at regenerating communities by encouraging affordable housing is underway in Pembrokeshire. Arwain Sir Benfro – the Local Action Group (LAG) for Pembrokeshire, have provided funding of £86,300 to Pembrokeshire Community Land Trust. This is funded through the LEADER programme, which is part of the Welsh Government Rural Communities – Rural Development Programme 2014 – 2020, Funded by the European Agricultural Fund for Rural Development and the Welsh Government. PLANED, is helping to deliver the funding in the county while working with the Pembrokeshire Community Land Trust and Pembrokeshire County Council. The project launched in November last year and is currently exploring the need and demand within Pembrokeshire for community-led housing initiatives in order to deliver affordable housing for local people. 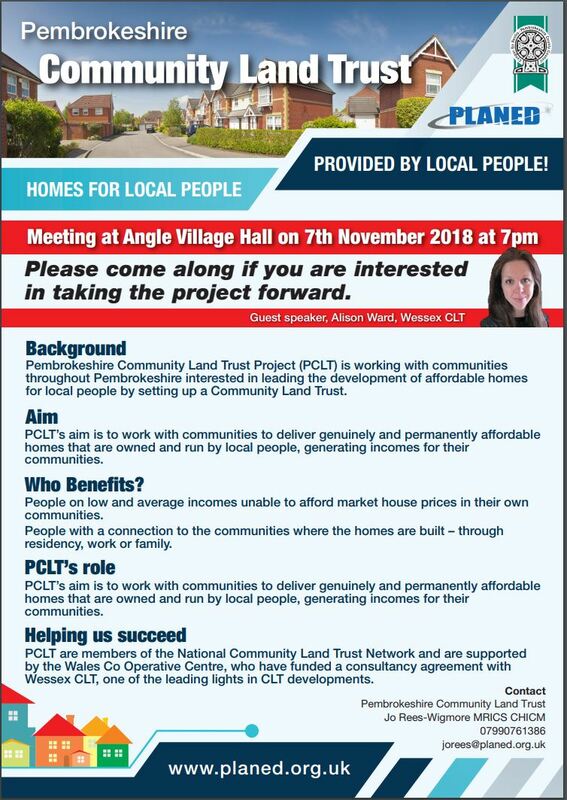 The county’s Community Land Trust (CLT) officer, Joanna Rees-Wigmore, explained: “Good quality affordable housing available for local people is integral to the sustainability of a community. In collaboration with West Country-based Wessex CLT – one of the leaders in its field in the UK – Pembrokeshire CLT is working with communities throughout Pembrokeshire to enable them to provide affordable housing for local people in perpetuity. Most projects generate sufficient surplus to include within their developments community infrastructure enterprises such as community shops and post offices. With this in mind, a community-shares scheme is also being floated to encourage investment in such enterprises. Already a number of potential sites for affordable housing have been identified across Pembrokeshire including Angle, Crymych, St Nicholas, Clunderwen and Martletwy. 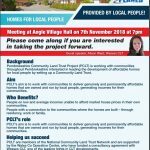 A public meeting is taking place in Angle village hall on Wednesday, 7th November, at 7 pm, when Alison Ward of Wessex CLT will explain her experience in helping communities establish community land trusts across Somerset, Devon and Dorset. An important contribution to some projects has been the philanthropic donation or gifting of land to communities. Anyone interested in exploring this possibility is encouraged to contact Joanna Rees-Wigmore by emailing: jorees@planed.org.uk or ringing 07990761386.